Goiter is actually not a cancer and most are benign. Generally goiters are painless; however, a large goiter may cause breathing difficulties and cough. Goiter produces due to lack of iodine in daily diet. In many cases goiter also forms when there is under or overproduction of these thyroid hormones. Goiter treatment depends on goiter size, goiter symptoms and the underlying causes of goiter. Small goiters do not require natural thyroid treatment. 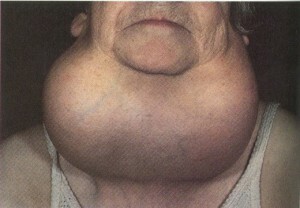 Enlarged goiter forms due to abnormal functioning of thyroid gland. Goiter symptoms include both hypothyroidism and hyperthyroidism. Instability in the thyroid gland is the basic cause of goiter. Women and elder people mostly suffer from this disease.